Carbon dioxide has been used for enhanced oil recovery for nearly 40 years. The first large pipeline to deliver CO2 to for EOR was completed to the Sacroc field in Texas in the early 70’s. Major oil companies then built pipelines from naturally occurring CO2 sources to oil fields in the Permian Basin and Mississippi. These projects have been successful and in 2010 27,000 barrels per day are being produced from Mississippi and almost 230,000 barrels per day are being produced from Texas and New Mexico. This production can only grow. Occidental Petroleum for instance states that they can produce up to three billion barrels from the Permian basin and Denbury is expanding their production and collection of CO2 in Mississippi, Louisiana and Texas to one billion cubic feet per day (57,000 tons per day). This could triple oil production from Denbury’s Gulf Coast fields. The following table suggests that those numbers are a small fraction of the CO2 EOR potential in the United States. In 2006 Advanced Resources International produced several reports and the following Table for the US DOE. These estimates included only large fields which were expected to produce 65 percent of the total production for the basin and were constrained by a $2/mcf price of CO2 and an oil price of $40 per barrel. At an oil price of $70 per barrel these production estimates may be larger. The table shows that 88.7 billion barrels of oil could be produced in the United States if enough carbon dioxide was available. Six to ten mcf of CO2 (0.35 to 0.58 tons) are used to recover a barrel of oil. So, 31 to 51 billion tons of CO2 could be sequestered with CO2. The United States produces 8 billion tons per of CO2 per year and capture of 10 to 15 percent would provide enough CO2 to recovery 88.7 billion barrels in thirty years. If only half of this oil was produced US oil production would nearly double. Four contiguous regions are highlighted in the table. 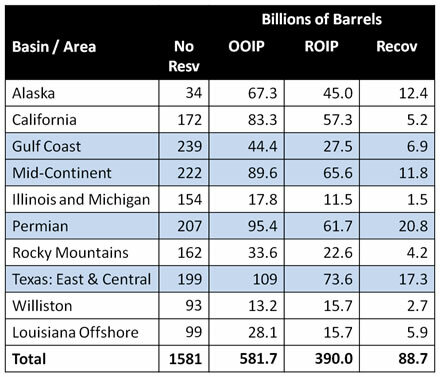 These regions which include Texas, New Mexico, Oklahoma, Kansas, Louisiana and Mississippi could produce 56.8 billion barrels of oil from 867 oil reservoirs. This is 74 percent of the potential recovery in continental United States. If half of that oil were recovered in 30 years 2.3 billion barrels a day of additional oil would be produced. It is clear that these numbers are very large and there is a big incentive to sequester CO2 for EOR because this can be done profitably. It should also be evident that other nations which have large supplies of 25 to 50 API oil can also use CO2 EOR to recover oil and sequester CO2 profitably if they can collect their CO2 from power plants and chemical plants. The success of CO2 flooding in the Permian Basin is well documented. The following figure shows oil production from the Sacroc field. 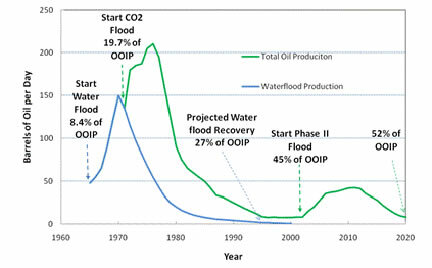 The figure shows that 8.4 percent of the oil had been produced when a waterflood was started to repressurize the reservoir in 1965 and had recovered 19.7 percent at the start of CO2 injection in 1972. Approximately, 200 Mcf/day of CO2 was injected until 1990. Production declined when injection was reduced but increased again as when injection began in a new area around 2002. The figure shows that the 52 percent of OOIP should be produced by 2020. CO2 can be used to recovery oil where the CO2’s density is at least 0.5 grams/cc, the oil has over 25 API gravity and CO2 is available. MK Tech Solutions has helped engineer over a dozen CO2 floods in North and South America from both industrial and natural sources of CO2. We can help with your project.